Last week, I had a lovely intern Sarah spend the week with me getting a behind the scenes look at running my practice and blog. Although I only get the opportunity to take interns a couple times a year, I just love working with them and seeing their eyes open to seeing the life-changing practice of intuitive eating applied. Before reaching out, she hadn’t heard of intuitive eating, so I had her read the book before our rotation. I love that she came with an open mind and lots of great questions! On the last day of our work together, Sarah got to do a practice session with one of my local Columbia instagram followers, and she did such an amazing job asking questions and listening, normalizing what they were going through, and coming up with practical ideas - I felt like such a proud mamma bear! As part of our work together, I assigned her a blog post for these yummy chocolate chip tahini cookies that I baked. They were inspired by a recipe I saw in the New York Times for salted tahini chocolate chip cookies, so I would highly recommend also dusting these bad boys with a little bit of flaky sea salt - I would have but ran out. 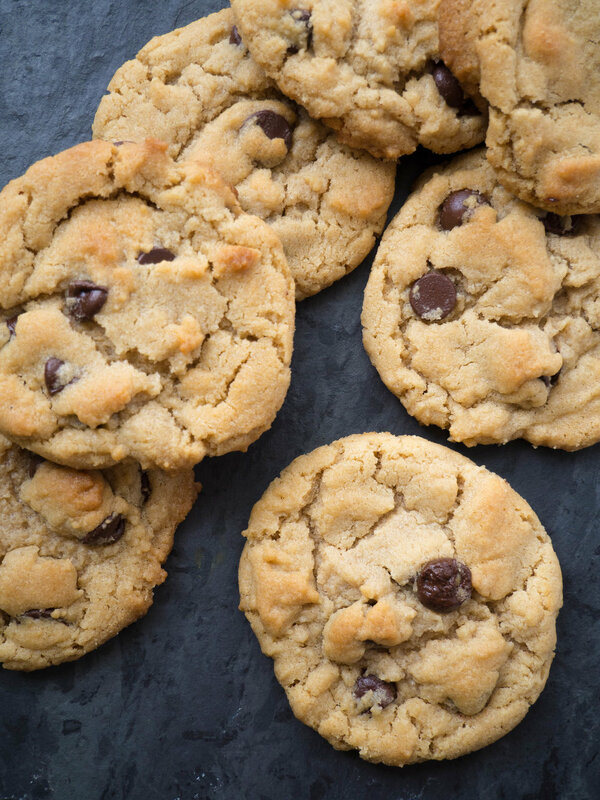 To make them, I just swapped my usual peanut butter cookie recipe for tahini. The sesame flavor isn’t overpowering - I promise these cookies don’t taste like hummus! 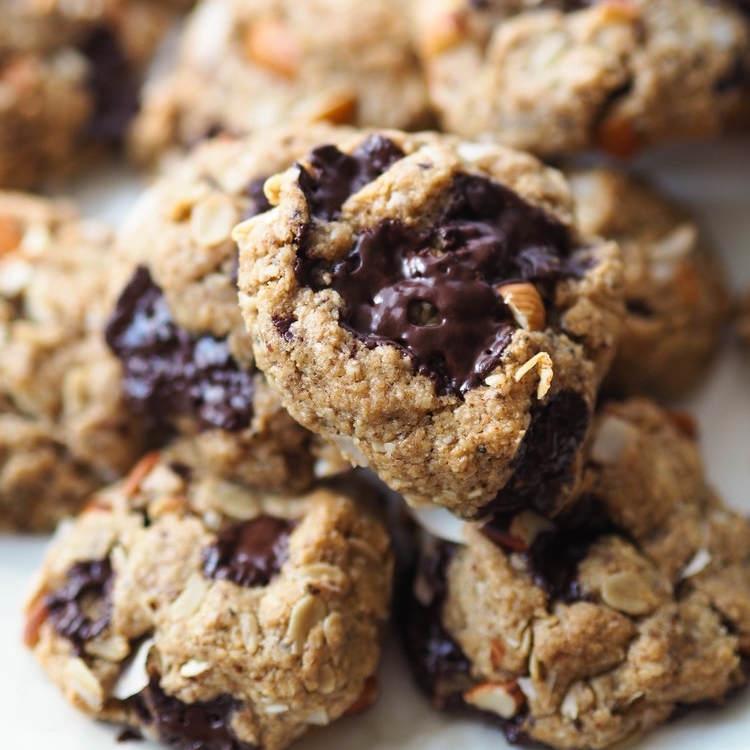 Paired with the bitter, dark chocolate chips…y’all, just make these already. Hi! My name is Sarah Rivers, I live in Columbia, SC with my husband and three boys. I have twins that are six and a 3 year-old. I’m currently in school full time at the University of Alabama, majoring in Food and Nutrition. When I’m not momming, wifeing or studying, I guest write on blogs to share my experiences in motherhood, life, nutrition and my families intuitive eating journey. Excited to guest blog here on The Joy of Eating. I completed an internship last week and can’t wait to share some of what I’ve learned from Rachael. Cookies……..I mean what else needs to be written, right? Well today I’m going to tell you how these delicious circles of delight represent freedom for me and my family. Three months ago, I was introduced to the world of Intuitive Eating. Full disclosure I read the book, because my internship preceptor (Rachael) required it. I knew it was not going to be for me, I knew it was not going to change my mind on nutrition…and I could not have been more wrong. Letting go of the restriction centered mentality, that I was unaware I had until I read the book, freed me to be more present in my life. How does a book or philosophy on nutrition do this you ask? Well I was able to stop weighing EVERYTHING I eat (which always put me getting to the dinner table last and missing most of the meal). I stopped worrying about what I would eat when we went out and started to enjoy experiencing new restaurants with my family. I stopped the guilt that accompanied what I now refer to as play foods. However, the best thing of all, meal times at my home became more peaceful. I make nutritious meals with lots of variety and allow my boys to claim the independence they crave and choose what and how much they want to eat. Let me tell you this was hard since I grew up in a “clean your plate before you leave the table household. My boys are beginning to understand that health and beauty comes in many different shapes, sizes, and color. I on the other hand am beginning to understand that the thoughts associated with foods are most times more detrimental to my health than the food itself. So, these days we keep play foods like cookies in the pantry and I enjoy them guilt free, with a side of joy and decaf espresso. Lastly, I want to thank Rachael for having an impact on my family far greater than I imagined possible. If you are interested in learning more about Intuitive Eating check out the book I mentioned above or reach out to Rachael. At the end of the day at least go make these scrumptious cookies and enjoy! In a medium bowl, whisk together, flour, baking soda, and salt. In another large bowl, blend together butter and sugars using a mixer on medium-high speed until light and fluffy. Scrape down the sides of the bowl, then beat in the egg and vanilla extract. Scrape down the sides again, and beat in the tahini, until well combined and creamy. Using a wooden spoon, stir the flour mixture into the tahini mixture until well combined. Stir in the chocolate chips. Cover the bowl with wrap (I just got these reusable wraps and love them!) and refrigerate 30-60 minutes. Preheat oven to 375 degrees. Line a baking sheet with parchment paper or a silicone baking mat, and drop rounded tablespoons of dough about 2 inches apart. Bake until golden, about 12-13 minutes. Let cool on baking sheet, then transfer cookies to a cooling rack. Repeat with remaining dough. After cooling completely, store in a covered container for up to a week.